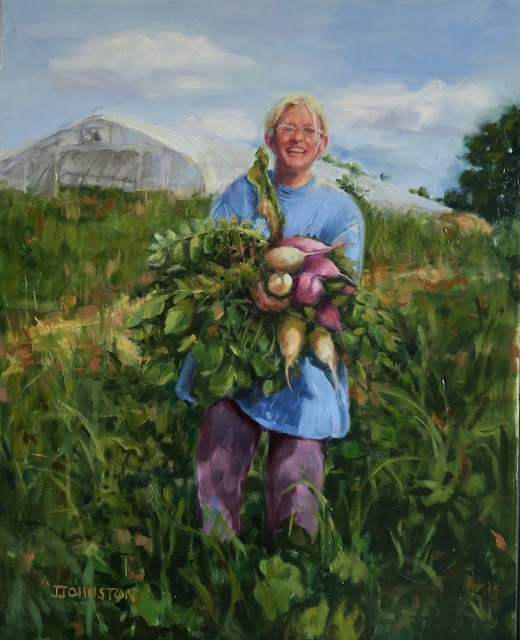 Sandy Dietz with Whitewater Gardens in Altura, Mn is another incredible farmer from my painting series of SE Minnesota Women Farmers. Sandy, along with husband Lonny, has been farming since 1996 when Sandy left her job to begin growing produce on a small patch of their land. She sold her produce, displayed in the beginning on a card table, at the Winona Farmers Market. Lonny left his town job to join her full time in 2001 expanding their farming venture. Organic farming is their passion. They are committed to improving the land and to bringing the highest quality certified organic produce to their community through the local farmers market and Bluff Country & Peoples Co-ops. Whitewater Garden sweet potatoes are the finest in the area along with year round tomatoes grown through the winter in their greenhouse. Whitewater grows a variety of produce including fresh ginger and turmeric! This oil painting documents the delight Sandy (& I ) felt as she “checked” to see how the winter radish crop was coming along. Obviously they were doing fabulously!